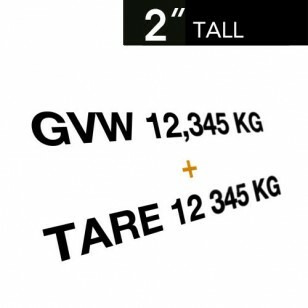 What are GVW & TARE decals? Apr 24, 2014 What does TARE mean? The TARE weight of a vehicle means the weight of the vehicle when it is empty or not carrying cargo. 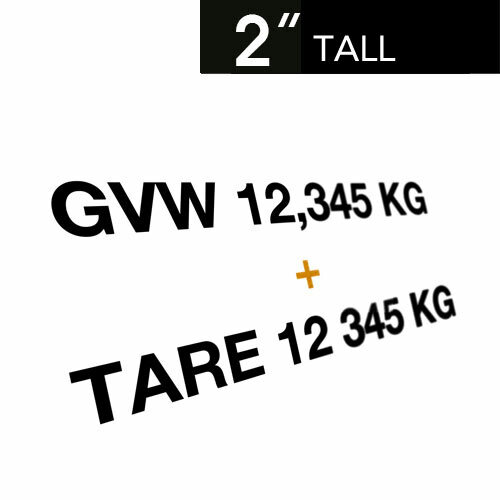 W..
GVW & TARE Decals comes in a set of 2. Provinces and territories have laws that establish maximum vehicle weights. This is to ensure public safety and to protect provincial highway infrastructure. Carriers must comply with all weight restrictions for the roads they operate on. Based on the province, legal weights depend on different things such as the type of vehicle, the number of axles on the vehicle, the manufacturer’s rating and the size of the tires on the vehicle. The licensed maximum gross weight of the vehicle (GVW). The TARE weight of a vehicle means the weight of the vehicle when it is empty or not carrying cargo. The GVW (Gross Vehicle Weight) of a vehicle means the licensed maximum weight of the vehicle as per the vehicle’s certificate of registration. The letters and numbers listed on the side of a vehicle must be at least 50 millimeters in height. They must also be a different color from their background so that the information is clearly visible. All information listed on the vehicle must be accurate. A commercial vehicle must not be operated on a highway unless the owner of the registered vehicle has correctly decaled the sides of it. Quantity in Set of 2. Clear Legibility & Visibility Font, Upper Case Only. Meets Regulation 50mm (Approx. 2") Minimum Height. Available in a variety of base colors. Material/Size: Premium Outdoor Vinyl, 2" Tall. Withstands pressure washing and mild chemicals. Width based on character count. For customized formatting, high volume fleet purchases or questions regarding compliance & regulations feel free to contact us.